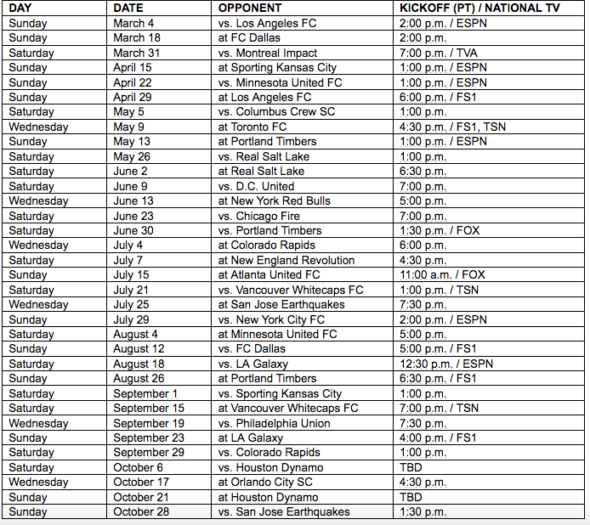 The defending Western champion Sounders have 13 games on national TV in 2018, starting with the opener March 4 at the Clink against expansion Los Angeles FC. 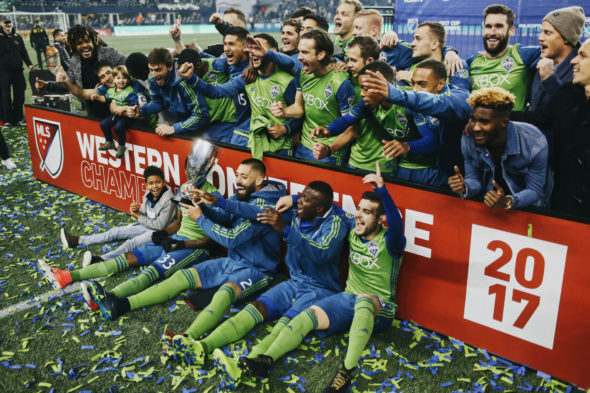 Beginning their 10th MLS season, the two-time defending Western Conference champion Seattle Sounders open 2018 against the expansion Los Angeles FC at 2 p.m. Sunday, March 4, on ESPN, one of 13 games nationally televised in the 34-game schedule announced Thursday by MLS. All three games against Cascadia rival Portland (May 13 in Portland, June 30 in Seattle, Aug. 26 in Portland) will be on national TV as well. Vancouver will show up July 21 in Seattle, and hosts the Sounders Sept. 15. The Sounders meet their Eastern Conference rivals from the past two MLS Cups, Toronto FC, at BMO Field May 9. The final regular season game is at home against San Jose Oct. 28. In MLS’s 23rd season, Los Angeles FC becomes MLS’s 23rd team and second in LA, where on April 29, the Sounders help open the new, 22,000-seat Banc of California stadium on the old Memorial Sports Arena site next to the Coliseum. The Sounders gather Jan. 22 at Starfire in Tukwila before heading south to training camps in Chula Vista, CA. (Jan. 22-28) and Tucson, AZ. (Feb. 2-8). The Sounders open CONCACAF Champions League play against Salvadoran club Santa Tecla FC Feb. 22 in the Central American country, then host Tecla March 1 at the Clink. Both are at 7 p.m. PT.